Fever is on my list, as well! I just recently read Wither. And I'm participating in a Wither/Fever Read-Along at The Overstuffed Bookcase if you want to check it out! I also need to read Clockwork Prince. Great picks! Fever is definitely one I need to read and I'm trying to read Delirium right now. I just have a lot to read. Great lists! I need to read almost all of these as well. BAH! Shatter Me!!!!!!! I totally forgot that one! AND FEVER. Luckily I remembered Pandemonium. Thanks for the reminders! Fun blog, and your personality is adorable. New follower! - Jana @ That Artsy Reader Girl. 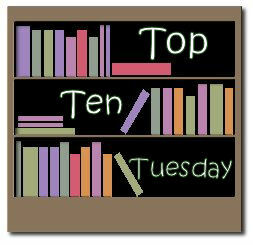 Visit my Top Ten Tuesday! Pandemonium is one of those books I want to get to soon as well. A few others on your list look tempting too. I just read Purity last week, and I thought it was really great! I was wary at first, because like you said, Jackson writes FT Retellings, but it turned out to be one of my favorite books of hers. Fever and CW Prince were brilliant, or course. I'm reading Pandemonium now, and I love it. Great list!